April 13, 1955 – The Chicago Daily Tribune reports that a proposal to link Midway and O’Hare Airports to the Loop by way of a monorail system able to move trains at 75 to 150 miles per hour will be proposed to the city council at its next meeting on April 21. The plan calls for the system “To run west form the Loop to Cicero av. In the Congress st. super-highway, where it would not interfere with surface railway operation, and then branch north and south, one branch going to Midway, the other to O’Hare.” [Chicago Daily Tribune, April 13, 1955] The system would be double-tracked with trains “supported on the arms of ‘T’ shaped supporting structure 26 feel high,” giving the trains 16 feet of clearance above the ground. Estimated time from the Loop to O’Hare is 14 minutes with a little less time required for a trip to Midway. Officials estimate the cost of the project to be close to $12,000,000 with $2,000,000 required for the construction of terminals. Another great idea that goes nowhere. On June 7, 1956 the City Club of Chicago recommends that the city study the idea. 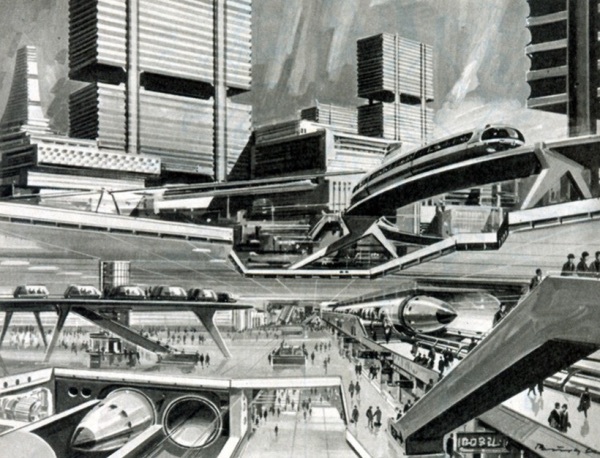 The next time the concept comes up is in September of 1959 when the city’s transportation department introduces the idea of a monorail system between the Loop and the proposed exposition center on the lakefront. Of course, that didn’t happen either. It would take considerably more than $12,000,000 to make the idea happen today, and the conversation is still going on over sixty years later about how to move people quickly from downtown to the outlying airports. April 13, 1953 – Dr. Konrad Adenauer, the Chancellor of the West German Republic, stops in the city while on a goodwill tour of the United States to make a major address in which he asserts that he would never agree to “a neutralized, disarmed Germany, barred from an equal treaty making status with other nations.” [Chicago Daily Tribune, April 14, 1953] On this day the Chancellor’s T.W.A. plane arrives at 5:20 p.m. after circling to show Adenauer a good view of the city. His daughter and a party of 21 people accompany him, and the German consul general meets the group as does Otto K. Eitel, owner of the Bismarck Hotel where the German leader will spend the night. On the following day Adenauer attends a luncheon at the Chicago Club for which Robert E. Wood, the board chairman of Sears, Roebuck and Co., serves as the host. Next on the docket is a reception in his honor at the University of Chicago at which Adenauer presents the university chancellor, Lawrence A. Kimpton, with several scholarships for study in Germany. The day concludes at a Germania Club dinner where Adenauer makes his policy address in German. 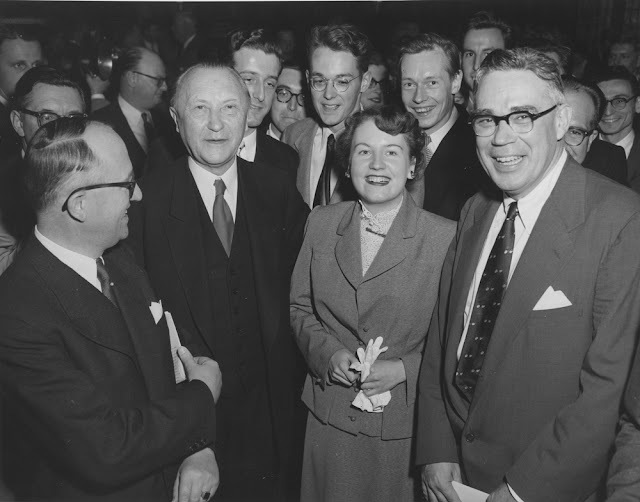 In the photo above Dr. Adenauer is shown second from the left at the University of Chicago reception. Dr. Kimpton is at the far right of the photo. 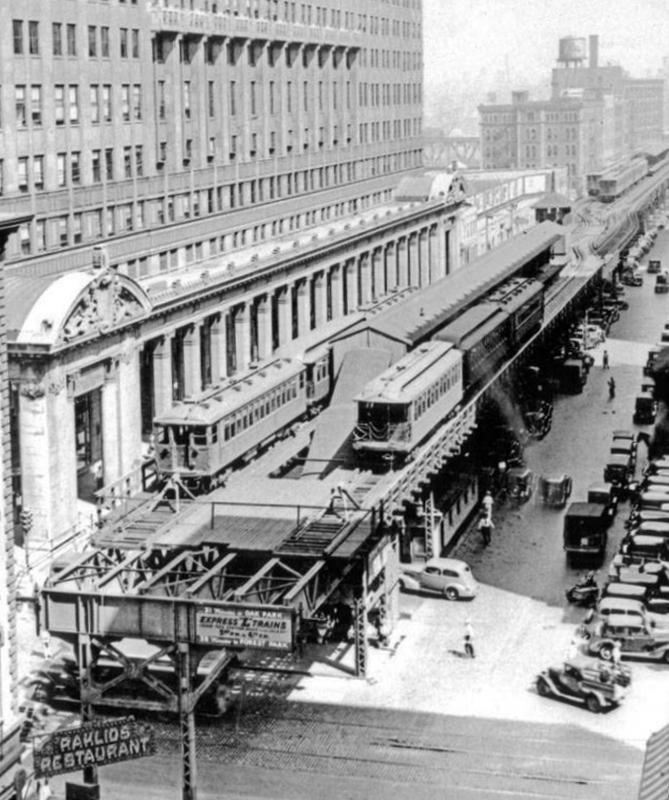 April 13, 1948 -- The Chicago Daily Tribune reports that Chicago Transit authority workmen have begun salvaging rails and signal equipment form the Market Street elevated stub, which will be torn down during the summer. Once the elevated structure is out of the way, the section of South Wacker Drive on which it is located will become the north approach of the Congress Street expressway, which is in a preliminary phase of construction. The photo above shows the Market Street stub where it ended on the east side of the Civic Opera Building.